The Japan Consortium, which includes public-service broadcaster NHK and the Japan Commercial Broadcasters Association (JBA), has extended its Olympic Games rights deal through to the 2024 summer edition in a 110 billion yen (£593 million/$1 billion/€733 million) deal which includes Tokyo 2020. Under the new deal with the International Olympic Committee (IOC), the consortium has also acquired rights in Japan for Pyeongchang 2018, as well as the 2022 Winter and 2024 Summer Games, which have yet to be awarded. The deal also includes coverage of the third Summer Youth Olympic Games, due to take place in Buenos Aires in 2018. The agreement covers all media platforms, including free-to-air television, subscription television, internet and mobile. The new agreement is a 61 per cent increase on the previous eight-year period and comes less than a week after Japanese tyre manufacturer Bridgestone signed a 35 billion yen (£204 million/$344 million/€252 million) deal with the IOC to become a global Olympic sponsor through until 2024. This latest deals follows last month's announcement that United States broadcaster NBC had signed a record $7.65 billion (£4.51 billion/€5.49 billion). agreement with the IOC to extend its broadcast rights deal through 2032. The Japan Consortium, set-up in 1984 and which includes a mixture of free-to-air and broadcast satellite channels, became the IOC's broadcast partner for the Nanjing 2014 Youth Olympic Games and the Rio 2016 Olympic Games in a deal unveiled in 2012. "We are delighted that we will continue to work with our broadcast partner, the Japan Consortium, until at least 2024," said IOC President Thomas Bach. "They have a proven track record in broadcasting the Games to the widest possible audience, which is the cornerstone of the IOC's broadcast philosophy. "The IOC redistributes over 90 per cent of its revenues for the benefit of the wider Olympic Movement, and the funding generated by this agreement will support sport around the world, future organisers of the Games, including Tokyo 2020, and ultimately the athletes themselves." NHK President Katsuto Momii admitted this contract carried extra significance because of Tokyo hosting the Olympics for the first time since 1964. "The 2020 Olympic Summer Games in Tokyo, which will be the first Summer Games to be held in Japan for 56 years, will draw particularly high interest for the public," said the head of NHK, which has been broadcasting the Olympics since Los Angeles 1932. "They are not merely a sports festival; they bring enormous significance for the future of Japan." Tokyo 2020 is expected to be the first major event to be broadcast in 8K high definition, technology currently being developed by Olympic sponsor Panasonic. 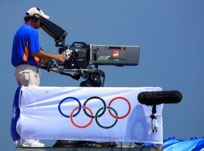 "NHK is devoted to spreading the excitement of the Olympic Games and to delivering inspiring Games through the most advanced technology, including free-to-air television, radio, digital services and 8K (SHV) from one end of the country to the other, and, in cooperation with JBA, will respond to the interest of the public audience," said Momii. A total of 861 hours was broadcast on Japanese television by the Japan Consortium during London 2012, eight per cent more than Beijing 2008. The highest-rated broadcast of the Games was the live coverage of the women's group stage football match between Sweden and Japan, which received an average audience of 23 million viewers, higher than any coverage from Beijing 2008. "We are convinced that the Japan Consortium, composed of the public broadcaster NHK and commercial broadcasters, will serve as the best system to convey the Olympic Games to the Japanese audience to the maximum extent. In particular, as for the 2020 Olympic Games held in our local city of Tokyo, coverage of the Games will be on an even larger scale compared to past Games," said JBA President Hiroshi Inoue. "We will now set out for thorough preparation, taking all possible measures for the Games. "The Japan Consortium has long worked with the IOC to spread the philosophy of Olympism - 'to place sport at the service of the harmonious development of humankind, with a view to promoting a peaceful society concerned with the preservation of human dignity'. "Now, with this long-term agreement, we have built a stable relationship with the IOC, which will enable us to convey the brilliance of Olympism more widely, deeply and constantly." said: "The Japan Consortium has provided excellent coverage of the Games, and we are happy that, as a result of this agreement, Japanese sports fans will be able to enjoy first-class coverage of the Games on their media platform of choice until 2024."